On July 1, 1863, more than 150,000 soldiers were drawn by fate to the defining moment of the Civil War. Men of honor in an age when honor meant everything, they fought out of loyalty to country or homeland, or to preserve states' rights; many more were moved to the defense of individual freedom. When it was over, a third of their number lay wounded or dead in the quiet wheat fields outside Gettysburg, PA. The Union Army had prevailed. The Republic would survive. 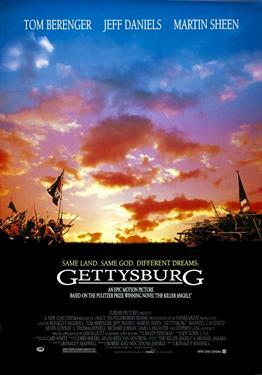 Based on Michael Shaara's Pulitizer Prize-winning novel "The Killer Angels," GETTYSBURG dramatically depicts the three most courageous days in American History as experienced by the leaders of the Confederate and Union Armies. The film renders the human dimension of the war with passion and power--from the fierce disagreements of Generals Longstreet and Lee, the brilliant Confederate leaders, to the Union's General Buford, who foresaw the devastation ahead.